Best RV Propane Regulators 2019: How to Choose the Right One? One of the essential pieces of our RVs is the propane system. Trying to enjoy your trip would be rather hard without one. I mean, you wouldn’t have access to crucial appliances that provide a comfy living environment abroad an RV: stove, oven, water heater, furnace, etc. But what a lot of people don’t understand is that your RV propane regulator plays a significant role within this system. And your RV’s propane system can cause all sorts of issues without a top-notch propane regulator. As a result, it becomes imperative that you invest in the best RV propane regulator possible to ensure your propane system runs efficiently. The only problem is that finding high-quality models can be an issue given the oversaturation of the marketplace. It’ll take a whole lot of effort and time on your part to ensure you get the perfect product, which is why this article exists. You see all the necessary information needed for this search is within this article and will make sure you’ll be able to make an informed decision. So please, keep reading and let us help you find the RV propane regulator for your circumstances. We’ll even provide you with ten examples of what we consider the best models on the market in the next section! As we promised, this section will showcase ten RV propane regulators that are the cream of the crop. But the best part is we’ll also review them to give a sense of whether or not each model’s a good fit for your needs. Our first RV propane regulator on this list comes from a company that you’re probably familiar with as an RV owner, Camco. This particular model lives up to the stellar reputation its manufacturer has by being a top-notch, no-nonsense type of product. It also helps that it offers a high-quality performance thanks to a variety of features, which I love. For instance, this model comes with a pre-installed POL fitting that’ll make installing this product unbelievably simple. I mean, this process is so easy that even someone who’s little bit unconfident in their mechanical abilities like myself could get the install done. The fact that it has 160,000 BTUs doesn’t hurt either as this feature should provide enough flow for the propane-powered appliances onboard my RV. You should also take comfort in knowing the flow of propane gas will be consistent, and you shouldn’t have issues in this regard as well. It can provide this smooth flow due to its 2-stage operation, which is almost unrivaled within this marketplace. In fact, multiple customer reviews praised how well this model was able to efficient power all their appliances. Anytime people find it necessary to go online and appreciate a product you should take that into account when considering buying it. 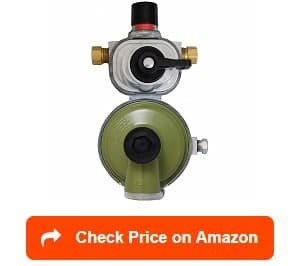 But the best part about this propane regulator is its affordable price. Sometimes these products can get a little expensive with the inclusion of unnecessary additional features; however, this model keeps it simple and ends up being extremely cost-effective. Even with its high-quality performance and cost-effective price, everything about this product isn’t all positive. Several customers reported having issues regarding this model’s durability, which isn’t something you want to see with a product such as this one. The Flame King 2-Stage Auto Changeover Propane RV Gas Regulator is a solid option for any RV owner. You see there are various features that this model has, which most people would find incredibly beneficial. In particular, I find the almost silent noise operation this propane regulator provides as something that separates it from other models on the market. I also love this model’s solid construction as several customers complemented its durability. It seems other products within this marketplace tend to fail relatively quickly. This issue wouldn’t be a problem with a well-built such as this propane regulator. The construction features a plastic rain cover as well, which will be invaluable in protecting the regulator against issue-causing elements: water damage, rust, corrosion, etc. All of these problematic environmental factors stand little chance against this high-quality cover. And the performance of this model isn’t too shabby either. You see it comes with two 12” hoses that allow you to connect two propane tanks in a rather straightforward manner. In fact, if your RV propane system has two tanks, this model would be an option you should explore. Its ability to handle two propane tanks also makes sure you’re never without propane access. Its automatic changeover feature will flawlessly switch over to the second tank when the primary one runs out of gas. I should mention that all these fantastic features come at an affordable price as well. Honestly, it’s a win in almost every category. But there’s one feature that this propane regulator has, which I’m not in love with: its BTU level. Overall, 30,000 BTUs is a little lower than I’d like especially considering the propane gas suckers I have onboard my rig. But if you don’t have large propane appliances, this product could be an outstanding option for you. If you’re looking for an automatic dual tank regulator (a product used for two tank systems), this RV LP gas regulator should be near the top your list. After all, this model has some awe-inspiring features that any RV owner would see as useful. I mean, take its two-stage construction as an example. This fantastic design will make sure you have a consistent propane gas pressure regardless of the circumstances. Its high-level performance is evident in the 262,500 BTUs this model will provide. Honestly, the performance of this model is second to none among its competitors. Its construction doesn’t just ensure a superior performance though as Fairview uses highly durable materials when manufacturing this product. You can reasonably expect this model to stay functional for a long time. I should also mention that as an automatic dual tank regulator, this model will automatically switch over to the second tank when it becomes empty; therefore, you never have to endure the thought of not having propane access when you need it most. It coming with two propane pigtail hoses isn’t a bad touch either as it’ll make the install process much easier. This product even has a color indicator that’ll tell you when the tank needs filling: it’ll change from green to red when it’s empty. This model is versatility as well as it’ll work with any RV: travel trailer, motorhome, 5th wheel, etc. Given all these wonderful aspects, it’s hard to see why this model isn’t already in your Amazon cart. But before you do buy it, you should know there are two flaws worth discussing with this model. First, it doesn’t come with mounting screws, which you’ll need to buy separately. Second, it’s one of the most expensive propane regulators on this entire list. The Marshall Excelsior MEGR-253 2-Stage Auto Propane Regulator comes from a company that will appear numerous times on this list. And given this information, you can gather that I find them to be one of the best within this marketplace. But with this particular model, several features stand out to me. For one, it has a durable and sturdy raw zinc construction, which will ensure environmental factors won’t cause this product any damage. I also find the fact that this model is an automatic dual tank regulator a beneficial aspect as it’ll ensure there will never be any gas outages. Its ability to produce 225,000 BTUs is another positive quality this model will provide the customer who ends up buying it. This amount of BTUs will easily power the propane-powered devices onboard my RV without any issue. And like the other automatic dual tank regulators we’ve reviewed, it comes with a color indicator that’ll alert you when the tank needs a refill. However, one area where it tends to soar past much of its competition is its versatility. You see this product can work in many different situations: RVs, cabins, cottages, small houses, etc. And it’s fair to say installing it in any of these situations is a relative breeze given the numerous customer reviews mentioning the installation process being extremely simple. With all these features in mind, it’s quite apparent that this Marshall Excelsior is a top-notch product. It does have one issue worth mentioning though; it tends to struggle in cold environments as it has a freezing proclivity, which can cause some serious RV propane regulator problems. But other than this one flaw, there isn’t a single thing about this product that I don’t find appealing. If you’re looking for an RV propane regulator replacement, you could do a whole lot worse than our next product from Camco. 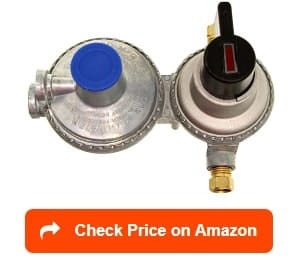 This 2 tank propane regulator offers the person using it a performance level that you don’t often see with these sorts of products. I mean, I would love to have a propane regulator that could produce 210,000 BTUs and still have all the capabilities of an automatic dual tank regulator. And that’s precisely what this Camco product gives the customer who’s lucky enough to purchase it. You see it can switch between tanks with it thanks to it being suited for a two tank RV propane system. And it does this without affecting the overall operation of your RV’s propane system, which makes this product incredibly convenient. 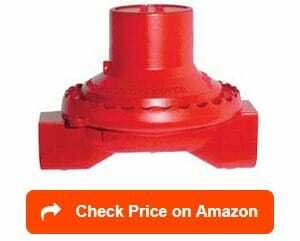 It also has a heavy-duty design that’ll ensure harsh conditions do not affect this product’s performance or durability. As a result, you can expect this model to perform its job admirably and without causing any hassles for many years into the future. Given this information, you can conclude that investing in this product would be a wise investment. It also helps that the cost isn’t too extravagant either, which is always a plus in my book as a potential consumer. But what I don’t consider a positive as a customer is lousy customer service, which several consumers reported encountering in their reviews. Honestly, this complaint was weird to see given the stellar reputation Camco has within most marketplaces. With this in mind, I wouldn’t put too much stock into those complaints as everyone tends to hate dealing with customer service no matter the situation. However, it was a prevalent complaint that I had to mention it at least. There’s nothing spectacular about the Mr. Heater Horizontal Vent Propane Two Stage Regulator; however, some times that’s what we should be looking for as a customer in a product such as this one. 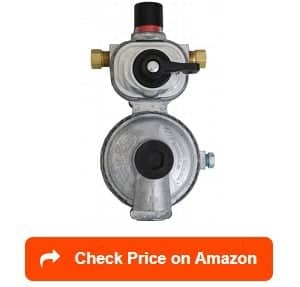 I mean, it has all the standard things you’re looking for in an RV propane regulator: the two-stage design, the raw zinc construction, a good amount of BTUs (160,000 BTUs), a solid 1-year warranty, etc. All of these things are standard in this marketplace, and this model doesn’t offer much outside of them. But every one of these features within this product does the job it’s intended to do at an efficient level. As a result, this model becomes an unremarkable, solid option that’s available at a fair price. Plus, it’s easy to install with its standard outlet (⅜ inches) and inlet (¼ inches) measurements: nothing worse than a product that makes the install process overly complicated. 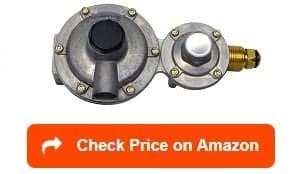 I should also mention that it comes with a pre-installed POL fitting, which is another feature that makes your life incredibly easy as an RV owner. In most areas, it seems Mr. Heater made sure this product was either remarkably solid or slightly above average. It’s even versatile enough to work with both indoor and outdoor appliances. There isn’t much that this model can’t do, which you’d look at as something you’d miss. The only thing is it can’t keep the propane operation when you need a refill. But given its overall solid performance, I think this issue is something we can live with and get over quite quickly. Although there was one area this product concerned me in though during my time researching it: longevity. You see a few customers mentioned in their reviews that this model tended to break down quicker than they expected. I must inform you that this population of the customers was the minority, but it was still a large enough contingent that it was worth mentioning. The JR Products 07-30325 High Pressure Regulator is the perfect model for all you RV owners with extremely high BTU needs. I mean, this model easily tops every other model on this list with the ability to produce 500,000 BTUs. But this aspect isn’t the only one where it excels; it also comes with a 90-day warranty, which will give you some protection against any accident or unfortunate thing happening to the product. After all, it never hurts to have a little insurance. I also love how easy this model is to install with both the inlet and outlet connectors having the same measurements, ¼ inches; therefore, you won’t have to buy two different types of hoses for this model. And since the product itself doesn’t cost much, the extra cost of these hoses won’t run your bank account dry. Given this information, you take comfort in knowing you aren’t getting duped into paying more than you would from purchasing other propane regulators. 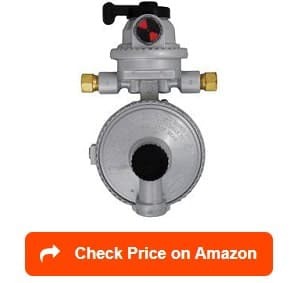 Overall, this JR Products model is a fantastic propane regulator that should be under consideration for you as long as it meets all your needs. But before you put this wonderful product into your Amazon cart, there is one little flaw you should know about as a potential buyer. You see this model has a few customer reviews that shine a light on this product having durability issues, which was a real downer for me to see during my search. It seems this product has a slight tendency to break down a few months after purchase. As a result, you must weight all the potential positives against this single flaw and decide whether or not it’s a deal breaker. In my case, it would be since spending more money on another regulator in a few months isn’t something I would particularly enjoy. Our second Marshall Excelsior product is also the first single stage model on this list. The critical thing to understand about these types of propane regulators is they can’t work with RV propane systems. But this particular model merits a place on this list because its excellent at working with propane-powered products outside your RV: barbecue grills, portable campfires, etc. In other words, smaller portable appliances that you might use during a camping trip rather than inside your RV. Nonetheless, if you’re looking for a product with those capabilities, there aren’t many that are much better than this particular one. I mean, it can produce 140,000 BTUs, which would easily power my gas grill with little to no problem. I also like its highly durable construction, which routinely received praise in the customer reviews. Every other consumer used a phrase like “well-built” or “high-quality design” in their reports. As a result, you can expect this product to help you barbecue for many years without causing any hassles or issues. It essential that I mention this product has an incredibly easy installation process as well. This aspect was another one, which was discussed heavily within the product review section. With qualities like these, it’s no wonder why this model is one of the most popular single stage propane regulators on the market. And it’s also helpful that his model comes at an incredibly low-cost. It’s easily one of the least expensive products mentioned in this entire list. Of course, this low price is a result of its limited capabilities. But even among other single stage models, it’s one of more cost-effective options; however, this model does suffer from a familiar flaw that continues to haunt this company: lousy customer service. The second single stage propane regulator on our list is the Camco 59013 Single Stage Propane Low Pressure Regulator. And as a Camco product, you can expect a certain level of high-quality that you might not see with other brands. For instance, this product is capable of producing 200,000 BTUs, which should be enough for most gas grills or any other smaller portable appliances. I also like that it’s capable of maintaining a constant propane pressure of 11 water column inches. With measurements like these, you can feel a sense of comfort that you’re getting a safe and effective product. If I were looking for a single stage propane regulator, this model would be near the top of my list. I should also mention that this model is easy to install as well given it has both the standard inlet (¼ inch) and outlet (⅜ inch) connections. As a result, you shouldn’t have any issues getting this product into its proper place. And the price is extremely affordable for a product such as this one as well. As someone that’s always looking for a bargain, you can bet I would have a serious debate about buying this model. But there is a particular flaw it has that’s worth discussing. Multiple customers have expressed concern over the product’s overall durability. You see many of them weren’t happy with the fact that they had to buy another regulator soon after purchasing this one. In some cases, it was only a few months after the initial buying date. An issue such as this one is something you should take incredibly serious and should have a significant impact on your final decision. The last product on this list is the Marshall Excelsior MEGR-253H 2-Stage Auto Propane Regulator, and it continues to showcase why this manufacturer’s one of my favorites. This particular model comes with a durable raw zinc construction, which provides peak durability. As someone who’s not looking to buy another regulator anytime soon, you can bet a feature likes this construction is something I valve heavily. And even if an accident does happen, I love that Marshall Excelsior will have my back with their inclusion of a 5-year warranty. Aside from being a reliable and sturdy product, this model excels with its performance as well. You see it can produce 350,000 BTUs, which should be enough to power whatever appliance you have onboard your RV. I also like that it’s an automatic dual tank regulator, which means it’s suitable for two-tank RV propane systems. As a result, you can easily remove an empty tank and refill it without losing your propane access; therefore, you’ll never have to worry about the nightmares not having propane access can provide you. Of course, this ability is only convenient as long as you remember to fill the tanks, which is another area where Marshall Excelsior helps their customer. You see it has a color indicator that some of the above models have, and it’ll alert you when a tank needs refilling. And all of these features come at a reasonable price as well. All in all, this propane regulator would be a valuable and reliable addition to anyone’s RVing experience. But it isn’t without flaws as the Marshall Excelsior customer service leaves a lot to be desired. A complaint like this one isn’t something you want to read when you’re considering a product such as an RV propane regulator. As with any product, there will be a few factors that’ll determine, which RV propane regulator is the best for your circumstances. And this section will discuss those essential factors to ensure you have a responsible decision about buying one of these products. 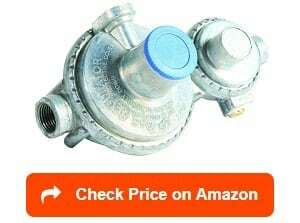 Most of the time an RV propane regulator is going to relatively cheap. These products routinely are sold for prices around $30, which isn’t exactly a truckload of money. But sometimes a manufacturer will try to entice you into spending more with a few “exciting” features. The key is evaluating whether or not these additional features matter to your circumstances. In other words, you should identify whether you want things like an incredibly high amount of BTUs or a warranty included with your purchase. It’ll be little things like these that’ll help decide a price limit you’ll be okay with spending. And once you set this price limit, it’s essential you stick to it; therefore, ensuring the product you end up buying doesn’t fill you a feeling of regret. In my experience, sticking with models that hover around $30 mark is where I tend to draw the line. Anything over that usually has features, which I don’t feel are necessary for my particular RV propane regulator needs. Given the critical role this product will play within your RV’s propane system, you must make sure it’s high-quality; therefore, examining the materials it was built from becomes a vital part of this whole process. You see these regulators aren’t going to last a lifetime. Even the best models have a 15-year lifespan, which means finding one that comes close to that mark becomes a necessity. As a result, a thorough evaluation of the product’s materials you need to do before settling on the right model. In most cases, this evaluation will mean understanding whether or not a regulator’s aluminum, brass, raw zinc, or stainless steel construction is durable. And the best way to figure this out is through reading the customers reviews. After all, there’s nothing that gets a customer angrier than a product that malfunctions or breaks down. Trust me; if there’s a durability issue with any of the product’s you’re considering, there be numerous upset, vengeful customers within the customer review section. Another thing you should look out for is the phrase “heavy-duty construction.” This wording is a sign that the manufacturer cared about how well their product held up against the environmental elements that might cause it problems such as rust or corrosion. Unlike a lot of RV related products, a propane regulator typically won’t have a complicated install process. In fact, it’s something you can usually do by yourself without any outside help from a professional. But there are some slight issues you could have with specific models. For instance, if you want an automatic dual propane regulator, there will be models that don’t feature mounting hardware. Its absent can make the installation process a bit of hassle for the customer. And this scenario isn’t the one that could cause you installation complications. With this in mind, it becomes clear that you’ll have to rely on those pesky customer reviews again. The customer experiences within these reviews will give you a clear indication about the install process’s difficulty. We should also mention that it’s a good idea to ensure the propane regulator you get comes with all the tools you need for the install. Buying parts or tools separately is just going to lead toward more research, which isn’t something you’ll want on your relaxing RVing trip. Each RV propane regulator you’ll encounter will have a different BTU capacity. This aspect is a measurement of the amount of gas that’s allowed to flow into your appliances. As you might expect, the higher the BTUs, the more gas the regulator will let out. But higher levels of BTUs also means it’ll end being more expensive. Given this information, you’ll need to access what number of BTUs would satisfy your particular propane needs. After all, if you get a model with a too low amount, it could result in your appliances not getting the gas they need to work. I’d recommend getting the highest possible flow rate that fits within your price limit. In doing so, you’ll ensure the appliances onboard your RV with have any issues getting the propane they need to function. Anything with over 50,000 BTUs should be efficient enough product to meet all your needs and expectations. Of course, whether you want to get higher or lower than this number will ultimately depend on what kind of appliances you have onboard your RV. Every RV propane regulator needs a cover to protect it from issue causing elements such as rust or corrosion. But some manufacturers don’t include covers with the purchases of their regulators, which can be quite a pain for a customer. After all, if you buy a regulator that doesn’t come with a cover, you’ll have to do more research and purchase one separately. This process isn’t just a hassle, but it’s also entirely unnecessary given the number of fantastic brands that offer a high-quality cover with purchase. As a result, do yourself a favor and opt to buy an RV propane regulator that comes with a cover. Its inclusion isn’t going to raise the price much, and you’ll save yourself from doing more product browsing on the internet. The topics we discuss within this section will cover all the general knowledge you might need to know about these products. In other words, this part of the article will do a bit of rundown on why having a high-quality propane regulator is so crucial. And once you have a grasp on this information, making an informed final decision won’t seem as daunting. If we do our job correctly, it’ll even seem simple! What is a propane regulator for RV? But the LPG powering these devices needs something to control it. After all, if propane isn’t safely monitored, it can become incredibly dangerous. An RV propane regulator will make sure using the propane never gets out of hand. In other words, the propane regulator will ensure your safety and keeps the propane run devices onboard your RV functional. It’ll monitor the propane pressure levels and make sure they stay at a reasonable level. The good news is an RV propane regulator itself isn’t overly complicated. There aren’t a million parts or pieces you need to be familiar with before buying one. All you need to have a grasp of are the inlet, outlet, the vents, and docking mechanism. It’s also essential you understand that these products need covering. There are plastic covers that are available for this specific purpose. Newer RVs will typically come with an effective one, but older rigs sometimes don’t; therefore, you’ll need to buy a cover separately. If your propane regulator malfunctions, your appliances will become useless regardless of the propane tank being full or not. And life onboard your RV will end up being extremely unsafe. It’ll also be incredibly uncomfortable and chilly. Given this information, it’s fair to say an RV propane regulator is a vital piece of a safe, comfortable RVing experience. And since safety should be your number one concern during your trip, getting a high-quality one should be a top priority. In most cases, RVs use what we call two-stage regulators. These models are much more capable of handling the responsibilities that regulating propane use on an RV requires than single stage regulators. They’re able to have this capability because a two-stage regulator regulates the pressure in two stages: hence, the name. This process will ensure the regulator manages the pressure safely and adequately. You see when the propane comes from the tank, it has an extremely high pressure level: usually between 100-200 PSI or sometimes even higher with landing it around 250 PSI. With this in mind, it becomes quite apparent you need it down at a more manageable level. This need is satisfied by the regulator’s first stage, which ensures the pressure comes down to somewhere between 10 and 15 PSI. The second stage further creates a safe environment by getting it down to 11 water column inches: the perfect amount of flow for your RV’s appliances. Doesn’t sound too complicated, right? Well, neither is the actual using process. In fact, it’s downright simple and shouldn’t cause you any issues. All you need to do is locate the regulator valve. From there, make sure it’s turned off when you’re filling up the tank. Once the tank is full, you turn the valve back on, and it’s ready to start powering all your RV appliances. We should also note that a lot of RVs come with two propane tanks. If you have a set up like the one described, you don’t need to buy a second regulator. You can instead use an automatic dual propane tank regulator, which will allow you to change back and forth between both propane tanks. The regulator’s lever will control this ability and is incredibly handy for an RV owner to have in their lives. After all, you’ll never have to worry about not having functional RV appliances; therefore, running out of heat or gas in the middle of RV trip shouldn’t ever be something you experience. Now, all you have to do is fill up your propane tanks! What are the different types of RV propane regulators? 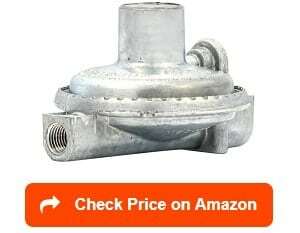 As with most products, there are few different types of RV propane regulators. Within this particular marketplace, there are three primary kinds that you’ll need to know about before making a purchase: single stage regulators, two stage regulators, and automatic dual tank regulators. Each one of these types has a different intended purpose and scenarios where their use would be appropriate. And we’ll discuss this essential information in more detail down below. Like we stated in the previous section, single stage regulators aren’t usable with RVs. These products are more suited for smaller applications that you might use outside your RV or during a camping trip. For instance, a single stage regulator would be more appropriate for use with something like a barbecue grill or a portable campfire. If you did use it with an RV, the pressure would come out at erratic levels, and the outcome could be highly damaging. Most RVs have two-stage regulators as they’re capable of handling all the propane needs you might have onboard your RV: furnaces, water heaters, stoves, ovens, and other appliances. There’s also high flow two stage regulators models as well, which are better suited for larger RVs. For example, if you have a 40ft class A RV, a high flow two stage regulator would be more appropriate for your needs. After all, these models can handle outside kitchens, multiple furnaces, and accessory connections for things like portable campfires and grills. If you have an RV with multiple propane tanks, you’ll need an automatic dual tank regulator. 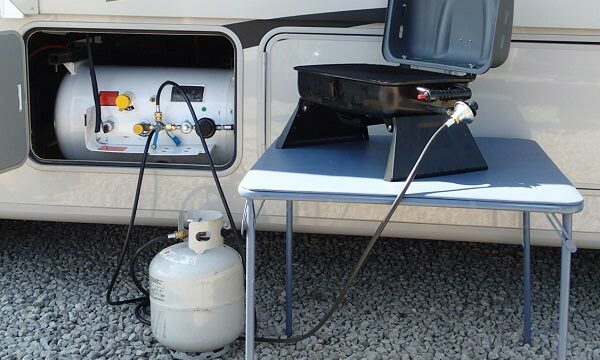 As previously explained, these models allow an RV owner to have a continuous source of propane; all made possible by the easy-to-use lever located on the regulator. With all this in mind, it’s quite clear that assessing, which type fits your personal needs the best is an essential part of this buying experience. And once you do, the number of options will dramatically lessen making the whole process will become less frustrating. Why do you need an RV propane regulator? There are numerous reasons why you need an RV propane regulator, but it mainly boils down to it being a safety issue. 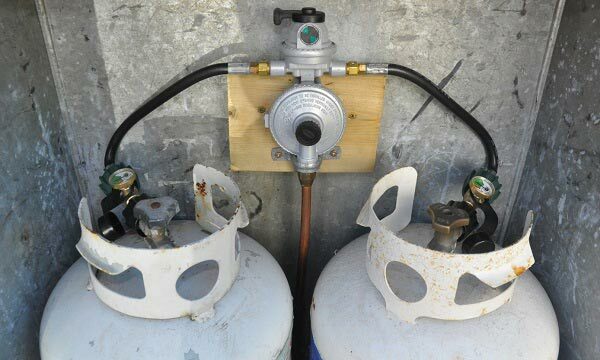 You see we use these devices to reduce the pressure in the propane tank to a safe level. This safe pressure level will make sure that the gas using products onboard our RVs can adequately function without causing any potential hazards; therefore, if you didn’t have a regulator, your ovens, water heaters, furnaces, and other appliances wouldn’t work effectively. In fact, it would cause these devices a variety of issues and consume more propane than they need. As a result, a high quality propane regulator will save you money by ensuring you don’t use unnecessary amounts of propane as well. Plus, the top rated propane regulators will also make sure you never have to experience camping without heat access. There’s nothing worse than being stuck in the middle of the camping trip and not being able to turn on the heater so you can escape chilly nighttime air. With benefits like these, I don’t see how someone wouldn’t ensure they have a high-quality propane regulator. Honestly, it’s one of the most critical aspects of the RV lifestyle and should be something all RV owners take incredibly serious. Like any well constructed FAQs section, this part of the article will answer the remaining concerns a potential customer could have about these products. And hopefully, the information below will help make this entire experience one that you don’t look back at with dread. What are good RV propane regulator brands? One of the most crucial parts of any buying experience is identifying high-quality brands from the companies who are trying to make a quick dollar. And it’s no different within the RV propane regulator world. The brands that outpace their competitors within the RV propane regulator marketplace are the ones you saw in our product review section. But even among those manufacturers, there are a few that stand out a little bit more: Camco and Marshall Excelsior. And below we’re going to dive into some background information that’ll showcase why these two brands are consistently providing their customers with top-notch products. Like with any RV part related marketplace, Camco is one of the leading brands and has built an unwavering relationship with their customers. This bond came from their willingness to put a focus on hard work and determination. This hard work and determination are critical in accomplishing their goal of “meeting the ever-changing demands of a challenging marketplace while serving [their] most valuable asset, [their] customers.” And a company who puts their customers above all else is one I can always feel comfortable buying from as a consumer. In other words, Marshall Excelsior will do whatever it might take to ensure their product is the best propane regulator for RV in the entire world. And they’ll also make sure the model that they create is affordable: this scenario is a win for whoever might end buying from this brand. Overall, if you find yourself buying from one of these two brands, there’s a low possibility you’ll end up dissatisfied with your purchase. In fact, if you buy from any company mentioned in our product review section, you’ll most likely come away with a high-quality regulator that’ll more than meet your expectations. How to adjust an RV propane regulator? Given propane’s dangerous capabilities, any adjustments should be left to a professional unless you’re one yourself. I know, it’s going to cost you a bit of money, but spending a little extra is better than something truly tragic happening. With this in mind, call a professional and have them adjust the regulator. It’s best to ensure the job gets done right rather than doing a DIY adjustment that may or may not fix the issue. In the end, there’s a reason why people do this kind of thing as their jobs. How to Connect a Propane Tank to an RV? 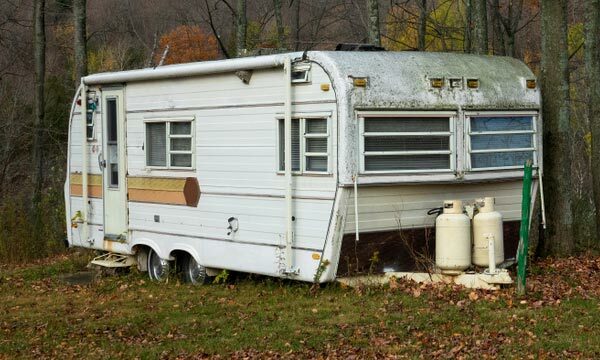 Examine your RV’s exterior and evaluate whether the propane is attached horizontally or vertically: horizontal connections will use ASME tanks, and vertical connections will use a DOT cylinder. Buy your new tank from a local store that sells them such as a gas station, RV shop, or auto shop. You could also use an old one you have laying around in storage. Using a propane tank that you’ve already own is recommended as you know its quality. Put the tank into the cradle. If you didn’t know, the cradle is the metal compartment used for the RV. From there, fasten the hose and propane connector onto the propane tank’s nozzle. You’ll want to make sure the connection is tightly secure. Latch or tie the straps into place to provide extra support. Anything that ensures the propane tank stays where it needs to be is a necessary part of this whole process. After all, it never hurts to have a little extra protection. Locate the valve on top of the tank and turn it slowly to the right. This action will start the gas flowing process, and the gas will enter into the hose. It’s essential you pay close attention to ensure you don’t hear a hissing sound. If you do, this situation is a warning sign that the connection is too loose or you have a cracked hose. With these five steps, this entire install should be a piece of cake. But if you do find yourself having issues, try your luck searching on YouTube for visual guide depicting the process. There are numerous guides on that site, which could be a more useful resource for the visual learners reading this article. 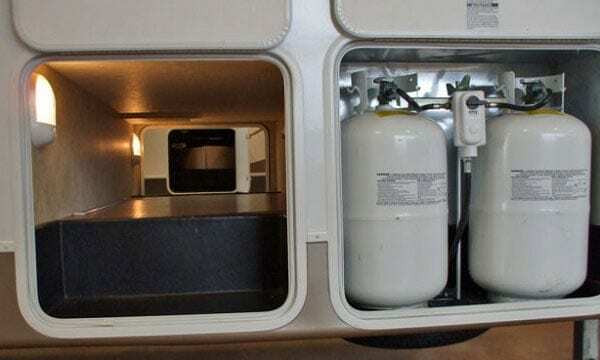 How to install RV propane regulators? Installing an RV propane regulator isn’t a complicated process; it’ll be a simple one that requires little to no effort. But the best part is that you don’t need a professional to do it unless you don’t feel confident in your abilities. The actual process doesn’t require many tools, and most manufacturers will give you everything you need with the regulator’s purchase. Of course, there will be some companies that don’t, which means you’ll have to buy the additional parts separately. In the end, this whole experience relies on your ability to follow the manual’s instructions, which will come with the regulator. If you find them to be quite clear and straightforward, you should have no issues doing this install yourself. But if you’re like me and aren’t entirely confident in your mechanical abilities, hiring a professional won’t be a bad idea. Plus, the price of this job isn’t too extravagant and shouldn’t empty your bank account. In most cases, it’s quite cheap. This whole process will ultimately come down to you applying the information from this article and finding the best RV propane regulator for you. Trust me; once you understand all the ins and outs of this marketplace, this whole process should seem a whole lot less overwhelming. 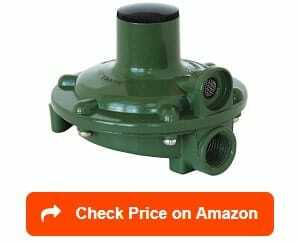 In fact, it’ll end being a process of merely understanding what you want in an RV propane regulator and finding the model that fits those requirements. 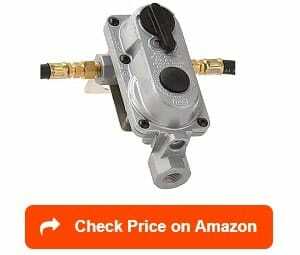 It might even be one of the RV propane regulators in our product review section. Once you do get this product, using propane on your RV will be much more relaxed and hassle-free. So please, use the information within this article to ensure you get the best product possible. After all, we just want to make sure everything about your RVing experience is top-notch. If you have any more questions, post them in the comment section below. We’d love to help you in any further way we can!